Approximately one-third of the Earth's land surface is desert, arid land with meager rainfall that supports only sparse vegetation and a limited population of people and animals. Deserts are also fragile environments. The misuse of these lands is a serious and growing problem in parts of our world. 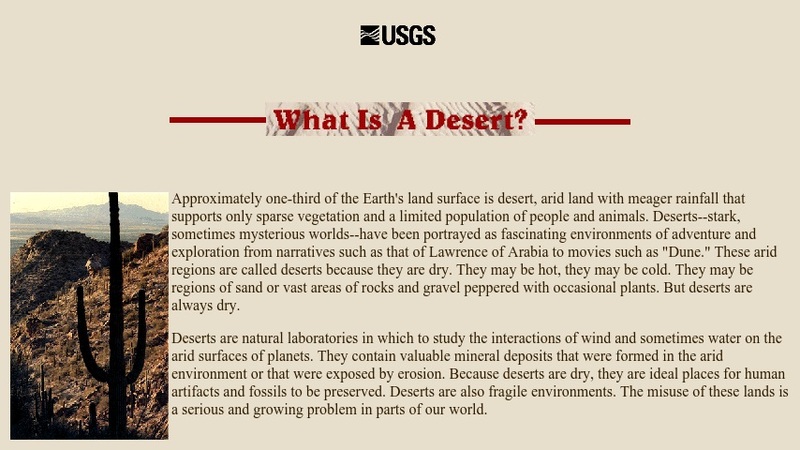 This web page, produced by the U.S. Geological Survey, describes how deserts are defined and classified. It features text, photographs, and a map showing the distribution of non-polar arid land.